These adjustable back support belts from Elliotts are made from breathable stretch mesh for guaranteed comfort, even after extended periods and in warm environments. The back support belts feature dual tension adjusters made of high grade industrial strength elastic and instantly adjustable side bands. The front closure element provides lumbar and abdominal support, which helps to remove strains away from the lower back. The back support belts are comprised of four seperate tempered steel stays that operate to reinforce vertical support, and rubber backed webbing helps to prevent the back support belts from moving around. Removeable 38mm elastic suspenders with a back adjuster provide added comfort, along with fully adjustable Velcro side bands. The back support belts feature reinforcing back stays for extra support and a tapered front ensures comfort even when bending. 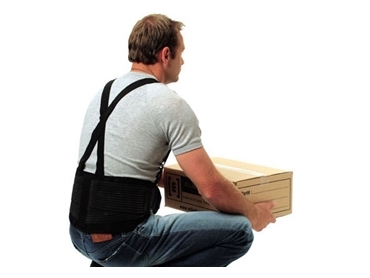 These back support belts are perfect for use across a range of applications as they effectively reduce the potential for injury and speed up the recovery process. Available in S, M, L and XL, these back support belts cater to all shapes and sizes.